This issue of scope came up in the comments to William’s post about Mormon versions of Netflix, YouTube and iTunes. Netflix, YouTube and iTunes reflect the big pond (of course), while these Mormon versions are the small pond. I think the conversation warrants its own post. Mormon products today are found in both places, to some extent. Most new books published for a Mormon audience do show up in Amazon.com, for example, and are available to nearly all bookstores in the US. The expansion of Internet-based stores like Amazon has essentially forced the producers of Mormon, Christian and other niche markets to participate in the national market. This broad availability has even led some of those who comment here on Motley Vision to suggest that the Mormon market be abandoned in favor of working with Amazon, other Internet-based stores, and even national retailers. I disagree with this idea. 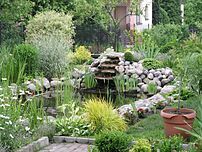 Regardless of how disfunctional the Mormon market is (and I think many of my posts here demonstrate just how disfunctional I think it is), we still need a Mormon market — we still need our own pond. The issue really revolves around where the customers are, more than where the products are. The just-released Zogby/Random House report shows that 43% of book readers in the US purchase most often online. In contrast, the poll implies that 23% of book readers never purchase online. While not exclusive, this does point to two different markets, two different groups of customers purchasing books. I’m not sure how that works for the Mormon market, but the anecdotal evidence I’ve seen here and elsewhere points to at least two different groups of consumers looking for Mormon materials also. So one problem with leaving everything to the national market is that some consumers will be left behind — they will no longer be able to purchase Mormon products the way they are used to purchasing them. Unfortunately, we don’t know what proportion of those that purchase Mormon products only purchase in stores and what proportion only purchase online. It is possible that the proportion that purchases Mormon products only in stores is quite high, so relying solely on the national market would reduce distribution significantly. Another problem is simply how visible Mormon products are in the national market. Like it or not, many Mormon products simply don’t appear as Mormon on Amazon and other online stores. This makes it difficult for consumers looking for Mormon content to find everything that is available. It may be that some of this latter problem will be overcome by improvements in the software at these online stores, allowing consumers to find Mormon projects easily. But even with improvements in the software, someone will still need to make the connection, to label those products as Mormon that are Mormon. Unfortunately, even if customers are asked to do this, a lot of products could be missed. While authors and producers need to participate in both the Mormon market and the national market, success is at times determined by the view that they have of what pond they are in. A large part of the disconnect between the current LDS market and many potential customers is the view of the market — where many, especially younger consumers, look for books that speak to Mormon culture and experience, the traditional LDS market seems to be providing “appropriate” products, those that represent “traditional values.” These aren’t necessarily the same thing. I’ve probably missed other issues on this issue, and I look forward to what you have to add. I’m highly interested in this idea of the disconnect, Kent. I’m currently reading “Rapture Ready!” by Daniel Radosh, which is about the Christian market, which is facing very similar issues, and I hope to have some thoughts on it very soon related to the issues bring up in this post. For now, let me just say that this idea of products that speak to Mormon culture and experience has become a bit of an obsession. I don’t know to what extent it is true that Mormon Gen Yers (and Gen Xers) are not as interested in “appropriate” entertainment, but IF Mormons are following the same pattern as the Christian market, then it’s going to become an increasing concern for those companies serving the Mormon market. Aside: I fixed the image size, Kent, so it no longer breaks the WordPress template. Something else to consider is that people–consumers included–naturally break down by social group. And so, while I may be able to get everything I want from Amazon, I often do my actual shopping elsewhere. Once Zarahemla pricematched their wares to Amazon, I started not just shopping at their site, but actually purchasing there as well. We find different pleasures at Barnes & Noble v. Seagull Books v. Small Town Used Bookstore Crammed Floor-to-Ceiling. All these experiences are valid because they are all different. Limiting the number of ways a product (in this case a book or film) can be discovered limits the likelihood of the full number of people discovering it in a manner that appeals to them. In the end, the wider the net’s cast, the more opportunities for success. However, we should realize that many, if not most, Mormon consumers will still use larger sites for their lower prices. How can this continue to be financially viable for Mormon retailers without some ad campaign like “Buy Mormon, we need it” (isn’t the sound of it just absurd?). What might be a better use of efforts would be to get lds-centric sites listed on sites like ‘http://www.dvdpricesearch.com/’ where they could be accessible to a part of the community who buys more frequently. That way they are still taking advantage of facilities which are already in place while maintaining retail autonomy. I’m also very interested in this disconnect. I wonder if it won’t end up seeing some of the effects of The Innovator’s Dilemma (to cite a book by a LDS Area Authority, no less). If I’m right, then many of the current players, especially the largest like Deseret Book, Seagull Book and Cedar Fort, will not be able to make the transition to the new paradigm. The real fear, IMO, is that the change will actually kill off the LDS market in any form at all, leaving us all to fend as small fish in a very big pond. This would be a disaster for the smallest players in the LDS market also, because they would no longer have the small pond to operate in. You are certainly right that consumer social groups purchase differently. We don’t know how Mormon consumers purchase, not really, nor do we know really what groups Mormon consumers break down into. You are not alone in not purchasing from Amazon — even if you regularly visit the site (like many do) for research. The survey I cited implies that 23% never purchase books online and 43% buy books online most often. The rest (34%) seem to straddle both online and offline. The survey also says that 2/3rds of all book consumers buy at least sometimes from Amazon.com! Yes each retail outlet offers a different experience, and many of us shop in multiple outlets in order to get different experiences. IMO, this is why we need both the “small pond” and the “large pond” that I discuss in the post. We need the variety, if nothing else. Your move to purchase directly from Zarahemla is laudable, and I hope more people do that. Zarahemla makes more on the book that way, and the discount is just as good for you. Unfortunately, Amazon.co.uk recently sued several British publishers for doing just that! could you send a link my way about that Amazon.co.uk suit? I certainly don’t mean to imply that its should be the sole focus of their efforts. I don’t believe that. Those that ignore the national market these days do so at their own peril. Good point — one I hadn’t included in the post at all. My own impulse is to proudly label products as Mormon despite the prejudice, but I recognize the dilemma. However, I should also point out that avoiding the Mormon label is more and more problematic. While New York Doll isn’t labeled by the producer as Mormon, its hard to imagine that anyone looking for information about the product wouldn’t come across the Mormon connection. Its clear in the description. More importantly, Amazon allows consumers to tag the products, and consumers have already tagged New York Doll as Mormon. And even without the tagging, a Google seach shows so many references to Mormonism that the linkage is crystal clear. BUT, I do agree that keeping a Mormon pond is important — not all titles have as clear a Mormon connection in the national market (many are indistinguishable on Amazon from a host of similar titles). Some, such as The Innovator’s Dilemma have no obvious connection to Mormonism in the content — and the author’s status as an LDS Area Authority isn’t clear in any connection to the book. But, of course, the ‘Mormon’ pond also ignores books like this for reasons I don’t quite understand. Yes, it sounds quite absurd. I know I wouldn’t do it. But that battle is already lost. Almost every Mormon-related title is already available in the big pond. LDS retailers have do invent a way to survive — perhaps by making so many connections among what is Mormon that other Internet retailers can’t compete. I’m very pessimistic about the current Mormon market’s ability to do anything like that. I agree that this would be a good use of resources, but this isn’t the only task that should be done, and I’m not even sure its the most important task that should be done (these price search sites, while an important source of links to book retailers online, are dwarfed by consumers that go directly to retailers like Amazon). I think LDS authors and publishers need to work with both worlds. And retailers need to finally get on line (Deseret Book is the only one that is really there). For the record, I’m wrong about it being a lawsuit. They are, however, taking unilateral action and reducing the amount they pay publishers because of the dispute. As always, I’m really grateful for your thoughtful responses. I only regret not being in a position to do much about it, and from how things are looking, by the time I am in a place it may be too late. Amazon needs to be careful–those kind of actions could lead to a WalMart-like backlash. It’s a shame that well-run, scientific surveys cost so much to run–it would be nice to learn something about the Mormon consumer specifically. Myself, I haven’t been to my area’s lone LDS bookstore the entire time I’ve lived here (almost two years) and visited the one in my previous city only once (although that one time I bought three DVDs and some books). In the past couple years, my LDS-specific bookreading has been mostly Zarahemla, stuff long out of print, and GA books I was given (about 50%, 40%, 10%). I’m pretty sure I’m not typical though. Previous Previous post: If Not For Money, Then What?